With up to two months advance notice and only with a doctor’s note, we will return the deposit minus an administrative fee of €25, so we will return €275 . After this date we will return only 50% of the deposit WITH a doctor’s note as proof of illness. IN ANY CASE, the deposit will only be returned AFTER THE EVENT HAS TAKEN PLACE. In all other cases the deposit is non-refundable, being considered a firm commitment to attend the course. Two weeks of Training, Practice and Profound Transformation. 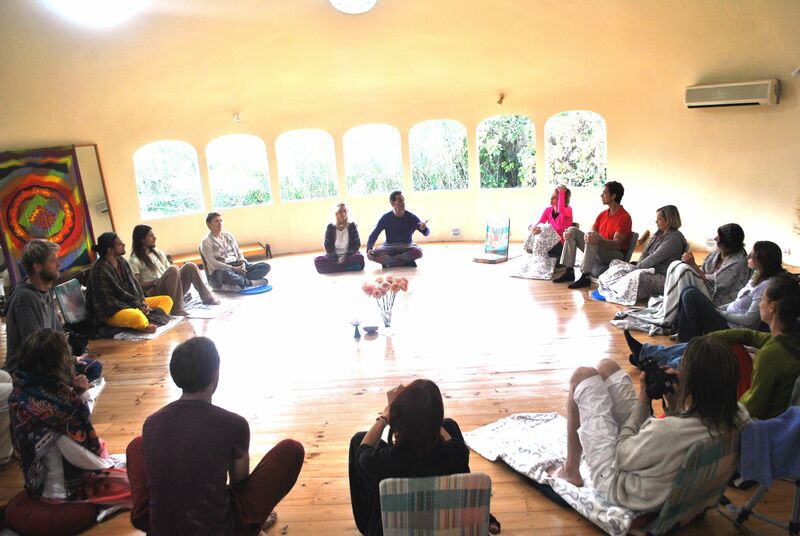 Become a Sound Healer with two of Europe’s leading Sound Healers and Teachers ! with Nestor Kornblum and Michele Averard. Full Board and Lodging at the Dome Center, WITH A FULLY VEGETARIAN MENU. For Professionals, Therapists of all modalities and Beginners too! About which course or training are you inquiring? 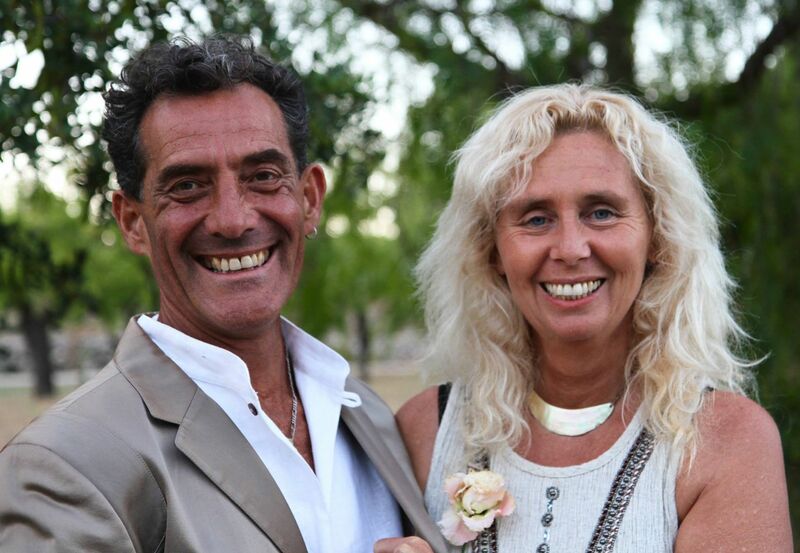 are internationally acclaimed workshop Facilitators who have trained thousands in the therapeutic applications of Sound, Vibration and Voice for 22 years. Our main emphasis is on the therapist and on the importance of understanding oneself as Vibration and developing the sensitivity, respect and care that is needed to be a Sound therapist/practitioner. Content will be the joining together of the 7 main areas listed below. This is an abbreviated list. The Science and Theory of Sound Therapy. How sound affects us on all levels of our being. Cymatics and other Sciences, such as Masaru Emoto’s work and others. The relationship of Sound and Energy to Matter and Form. Shamanism and the origins and History of Sound Healing. How to conduct a professional SOUND JOURNEY (Sound “Bath”) Healing Session for groups, with a variety of Therapeutic and acoustic instruments. Instruction on the healing applications of each instrument. The Healing Power of Sound and Energy. Practical techniques to take conscious control of the energy that flows through us, using the power of Intention, Creative Visualization and the Voice. Develop your natural clairvoyant abilities to Feel and Sense the effects of sound on yourself and others. Cleansing, harmonizing and balancing the chakras and subtle bodies with Vocal Sounds. Free your Healing Voice: Practical vocal and Intoning techniques to discover your authentic voice and its healing potential. Overtone Chant, Overtone Singing: Singing two simultaneous sounds by amplifying the pure, sine wave harmonics within your voice. This ancient and potent technique is used by Shamans in Mongolia and Central Asia to resonate with Nature and purify the Mind and Spirit. In the last 3 decades this has become a refined Sound Healing tool. We will learn the basic techniques and therapeutic applications. Everyone will be singing Overtones within the first day of this module! Sound as a tool for raising personal and planetary frequency. Sacred Geometry Part 1: The relationship between Sound, Musical Intervals and Ratios and Form. Singing Bowls, Himalayan and Quartz bowls: The origins, theory and applications in self–healing and applied healing. Includes practical sessions on healing the physical and subtle bodies. Tuning Forks and their application in Sound Health Therapy. Diaphony- the Bio-Energetic application of Tuning Forks on the Chakras and in the Subtle Energy Bodies (aura). Intervals (the relationship between sounds) and their effect on the human system on mental, emotional and physical levels. Sacred Geometry 2: The physical structure of Sound and its reflection in Nature. Harmonic re-patterning through Sound. The use of colour in conjunction with other sound healing tools, advanced energy management: Protection and cleaning of spaces, rooms and energy fields, as well as the treatment area. How to give a complete Sound Healing session. NATIVE DRUMS, Rattles, Ocean Drums and other instruments. Harmonic Integration. Revising and integrating the entire course. Bringing all the Knowledge and Practice together into a harmonious whole. Exams in the form of Practical evaluation and award of diplomas. – Evening Activities, after dinner on a few of the evenings, such as Mantra chanting, Sacred Sound Ceremonies. THERE WILL BE ONE FREE DAY IN THE MIDDLE OF THE COURSE FOR REST. 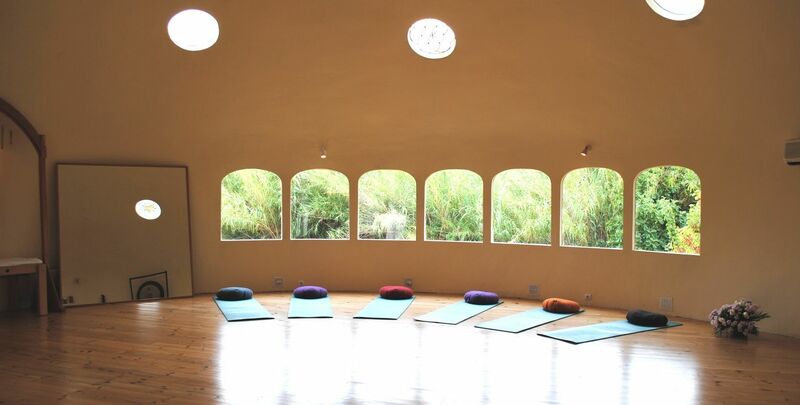 Is a centre for Retreats, Courses and Workshops located in Alcalalí, Alicante, in a beautiful rural setting and just a few kilometers from the Mediterranean sea. All meals are included. The food will be prepared by a qualified organic cook, and will be fully organic and vegetarian. Where possible local produce is used. Our excellent cooks are able to provide for special needs diets, such as gluten free, eaw food and so on, although there will be an additional charge of €5 due to the extra work involved and the cost of alternative ingredients. 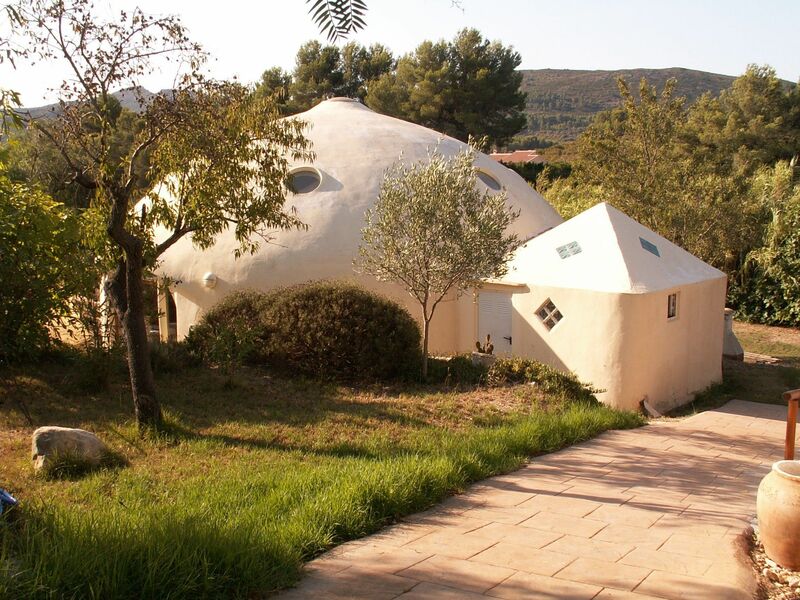 Will be at The Dome Center, in rooms for 2 or 4, and in two wooden cabins for up to 4 people. We seldom have more than 3 per room for this course, due to the longer duration. You may arrange additional nights at no extra charge if your flight plans require. ALICANTE (ALC) is the closest airport, 1 hr by car, a little longer by bus, and below are directions to get from the airport to the village of ALCALALÍ where the Dome is located. Go To: www.alsa.es and select your language. This journey varies depending on the ROUTE and TIME of DAY, so be please be very careful before booking: Many routes look the same but have many more stops or change of bus, along the route! It can take anywhere from 1hr and 45 minutes to 3 hours 30 minutes, so make sure to book the SHORTEST Journey after your arrival time at Alicante Airport. You will probably have to change BUS in the city of BENIDORM… Allow 30-45 minutes to get your luggage off the carousel and to the Bus point, especially if you’re coming from outside the EU and have customs to pass through, so you can get to the bus on time. The cost is 13.90€ approximately for this 100km journey. In Benissa be sure to get off at the Bar/Cafetería Frau Stop. FROM BENISSA you can call a taxi or we have a driver who will fetch up to 4 people at a time for €15 the Journey (not per person!) Let us know in advance if you will need this service. i.e. your arrival times at Benissa. TAXI from the airport can be reserved through us in advance for €110, much cheaper than other services. It makes sense to share with other participants who may be arriving at similar times, to keep the costs down. (unless local students are able to offer lifts). so there are great acoustics and an amazing peaceful energy inside.